We would like to bring attention to whom so ever trade / official members of CoinExMarket regarding listing scam. We request for listing EvenCoin (EVN) on CoinExMarket on 21st June 2018 and received email from their official email info@coinexmarket.io asking for 1 BTC listing fees. We paid too for listing and received official response stating payment is received and listing will be confirmed in 2 working days. 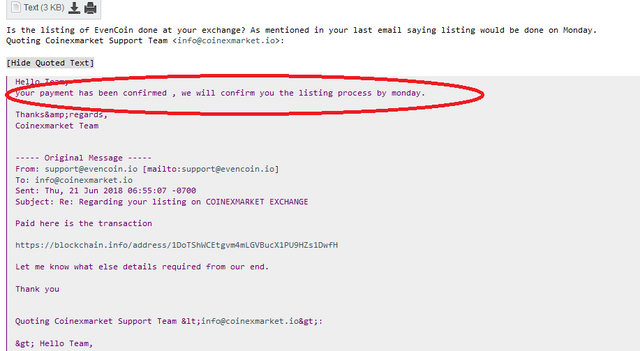 But not it has been 8 days no reply from their end i dropped many email regarding same but no reply nor EvenCoin listed on CoinExMarket. This would be serious matter to be considered in regards business with CoinExMarket. Let me know which thread it should be moved to? admin can you do that for us? Let me know which thread board it should be moved to? admin can you do that for us? You can do it yourself. The board name is Scam Accusations. Scroll down a bit then on the left hand side look for move topic link. Click it then follow the on screen instructions. We are not doing scam with your 1BTC listing fee, your token is already live for a long time back , plz check that and start your trade. Then you guys should get a proper support for your customers. Everyone expects a feedback when they send a message to support. You don't have to wait for the person to open Scam accusation before you debunk the claims. Work on that on your exchange because this is 1 BTC we're talking about. You won't fool anyone scam exhange https://www.coinexmarket.io. There was no photos of team on their website and their whole website looked shady. So i decided to investigate. And then i found this article from Vinchain project https://medium.com/@vinchain/this-is-how-coinexmarket-does-their-business-8cd9dc57c95e and the fact that Coinexmarket is stealing money looks like they are scam. Also several users reported that they received logged in from different IP addresses on their accounts and lost their cryptocurrency on this exchange https://bitcointalk.org/index.php?topic=2804375.new#new . When scammed users tried to alert other users they get immediately banned in telegram. Stay away from coinexmarket exchange! It's 100% scam. It is clear that ICO that CoinEx Market have now is also scam. Omg, hope best solutions soon.. this news not good for anybody. this what happens to our project, the coinexmarket team keep ignoring us, promising a day for updates then nothing, then another day, until they blocked and banned you from their telegram, Goodbye BTC (listing fee).. scam exchange.. how come coinmarket listed this scam exchange?